New England Area DISNEY FANS! Today is Your LUCKY DAY!! 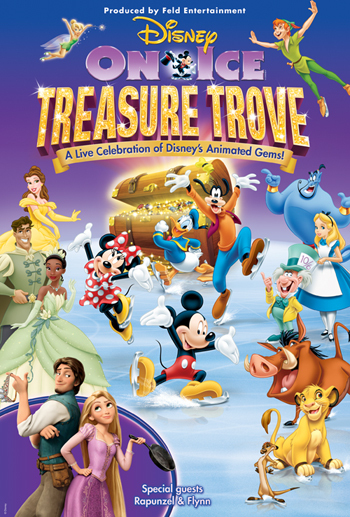 Disney On Ice presents Treasure Trove, playing the TD Garden over holiday vacation week! Tickets to the all-new Disney On Ice skating spectacular performing at the TD Garden December 26-29, 2011 go on sale November 11, 2011 – which just happens to be the luckiest day of the year. To commemorate this unique date, your wishes have come true. For one day only, 11/11/11, use promo code: MOMLUCK to purchase tickets for – you guessed it – $11.11* to Disney On Ice presents Treasure Trove, playing at the TD Garden from December 26-29, 2011. Show Description: Discover endless riches when Disney On Ice presents Treasure Trove comes to your hometown! Disney On Ice sets the gold standard with its newest skating spectacular. Get tangled up in Disney’s 50th animated feature with Rapunzel and Flynn and enter the worlds of your other favorite Disney princesses –Tiana, Cinderella, Jasmine, Ariel, Sleeping Beauty, Belle, Mulan and of course, the one who started it all, Snow White. Ahoy, Mateys! Set sail with Peter Pan, the always sassy Tinker Bell and the cantankerous Captain Hook and his pirate pals on an adventure beyond Never Land! Trek the wilds of Africa with Simba, Nala, Pumbaa and Timon as they discover the true meaning of the ‘Circle of Life.’ Tick-Tock! Tick-Tock! Don’t be late to a very important date with Alice and the Mad Hatter as they march with the Queen of Hearts’ Army Of Cards. Be sure to see this show full of memories guaranteed to last a lifetime. This entry was posted in Disney on Ice, Disney World and tagged Disney On Ice Treasure Trove. Bookmark the permalink.